This week, BS Filmworks is celebrating three sold-out screenings of our latest film "The Outsider" at the Denver Film Festival. 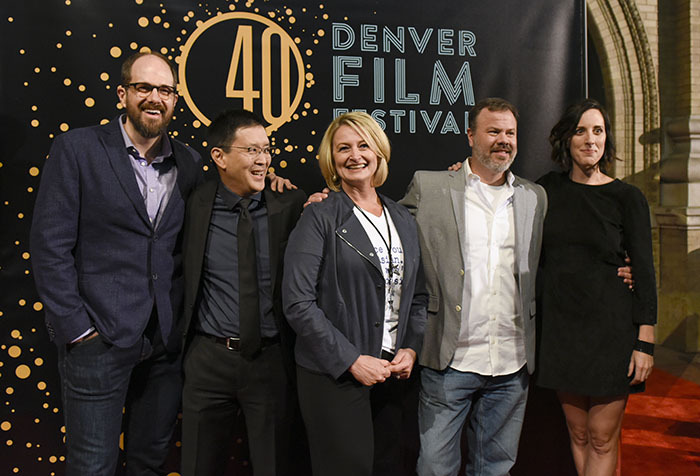 When the schedule was first announced, the festival assigned two screenings to our film, which was part of a block of 10 Colorado short films. However when the first screening sold out within hours, the festival quickly added a third one. "I think I might be responsible for the first sell-out," said writer-director Scott Takeda. "Our film heavily features my family which numbers more than one hundred, and I think many of them purchased the bulk load of the theater's 140 seats for the Sunday screening." "I'm most excited that our film seems to be affecting people," said producer Lori Kay Allred. "Obviously we had a lot of supporters during the first screening, however countless people have approached me after the second and third screenings. Many are in tears and excitedly talking about how our film has touched them. And I just talked with festival founder Ron Henderson at the filmmaker lounge, and he told me how much he enjoyed our film." The cast and producers of "The Outsider" also walked the red carpet during the festival. Lead actress Kate Cook flew in from Los Angeles along with fellow cast member Mike Ostroski who found an opening in his schedule between shoots for ABC's "Black-ish" and his recurring role on Nickelodeon's "Henry Danger." They joined BS Filmworks' Brock Sherman, Allred and Takeda, along with other LA dignitaries including Kyra Sedgwick, Bill Pullman, and Aaron Sorkin.